Pour soda in a medium saucepan and sprinkle with gelatin. Allow to soak for a minute or two. Heat over low heat, stirring constantly, until the gelatin is dissolved (about 5 minutes). Remove from heat. Pour into standard loaf pan (non-reactive metal or glass, approx. 9 x 5). Refrigerate until fully set (about 3 hours). To serve, cut into desired shapes. Alright, I admit it. I am an adult who has participated in Potter-mania. I have read the books and watched the movies. While I may attribute this to having a young stepson, who is an avid consumer of all things Potter, it’s quite likely I would have followed the series anyway. Who can resist? It’s just great entertainment! Clearly, I am not the only parent/grownup that feels this way. One of the most ardent recipe requests on the JSTK blog this spring and summer has been for “Something Potter –and in time for the movie release, please“. Well, Potter fans, rejoice! The series abounds with gelatin cocktail possibilities. Among them, Polyjuice Potion, and the ubiquitous chocolate frog stand out. However, Butterbeer, the beverage of choice among young wizards, was the frontrunner, and it makes a wonderful jelly shot! 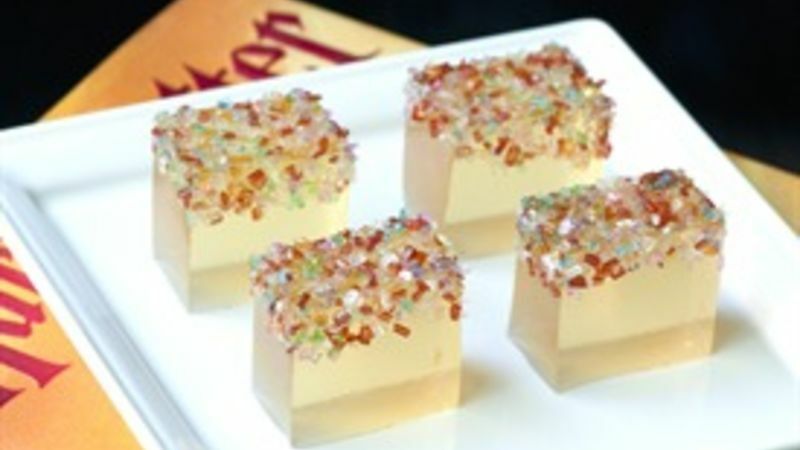 The Butterbeer Jelly Shot recipe is for an adult jelly shot, made with cream soda, vanilla vodka, and (lets not forget the “buttah”) Butterscotch Schnapps! (Make a kid-friendly version by gelling 2 cups of cream soda with a tablespoon or so of butterscotch syrup with 2 envelopes of plain gelatin.) Presentation options abound. The jelly shots are beautiful cut into simple cubes, with rainbow sugar on top, for a little sparkle. (Make sure to add the sugar just before serving – it's a beautiful garnish, but melts quickly!) Or mount the cubes lollipop-style on a “wand” (aka a wooden coffee stirrer). Either way, these delicious buttery-flavored jelly shots will be the hit of your pre-Potter movie festivities! Hope you enjoy these Butterbeer jelly shots! Watch for me and my stepson at the Potter movie premier – we’ll be right up front and center, eyes like saucers and grinning ear to ear, with a gallon tub of popcorn between us!